Sydney Skywalk is the only way to see the sights of the most beautiful city in Australia. 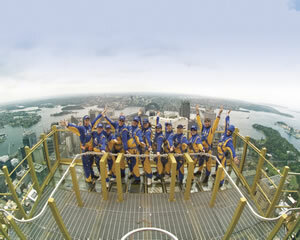 Stepping off the edge of Sydney Tower 260m above the city is an adventure you'll never forget. A Sydney Tower Skywalk gives the chance to take in 360 degree views of Sydney - from the beaches in the east to the mountains in the west. A Sydney Skywalk puts you at double the height of the Sydney Harbour Bridge. So if you like to live on the edge, a Sydney Tower Skywalk is something you need to put on your list. A Sydney Skywalk gift certificate is also a great gift for friends or family so get a group together and go for a walk on the edge today.If you can master your fears, you will not regret this experience. An excellent value tour giving you the best of Tamborine Mountain and Lamington National Park. Under an hour from the Sydney CBD. Get up close and personal with the friendliest Aussie wildlife at home in a bush sanctuary. Explore fascinating Aboriginal sites. Relax at the cafe and let the animals come to you, or go walkabout along the bush tracks. Learn about Aboriginal bush tucker/medicine. We offer nature based walks and hikes to Southern Queenslands World Heritage Rainforest. Spend a day with our Scientist trained guides to get an indepth understanding of these ancient Forests. Attraction pass for Sydney & Beyond. Over $900 worth of admission fees. Buy this 3 day pass for unlimited access to over 35 top attractions in Sydney. Includes free 128 page colour guide book with maps and local knowledge. Valid for 12 months from purchase. .
Sydney Skywalk is the most exciting Sydney kids activity! Far over our beautiful city, you'll experience one hour of Australia's best views. Ages 10-15 will be harnessed in safety for a unique experience they'll remember forever. You don't forget an adventure twice the height of the harbour bridge! Skywalk Sydney Tower for an exhilarating 60 minute outdoor experience! Feel perfectly safe, yet perfectly exhilarated, taking in views 260 metres above the harbour city. Dare to step out over the edge and face Sydney like never before, feel the high-altitude breeze and touch the clouds! Experience stunning views for miles as you climb to the top of Sydney Tower, the tallest building in Sydney. On a clear day you can see as far as the Blue Mountains on an observation deck that's 250m above the Sydney CBD! At dusk watch the sunset. At night, see Sydney sparkle in all it's lights! Follow an adventure-filled day with a relaxing and romantic night. Start with 360-degree views of Sydney on the Sydney Tower Skywalk. Follow this with a two-hour sail on a private yacht. And finish your day with an exquisite three-course dinner and live it up at one of Sydney's best hotels! Walk across Sydney's skyline, more than a quarter of a kilometre up above the city. Skywalk will literally send you over the edge! Attraction pass for Sydney. Over $900 worth of admission fees. Buy our 2 day pass for unlimited access to over 35 top attractions with transport. Includes free 128 page colour guide book with maps and local knowledge. Valid for 12 months from purchase. For use on 2 consecutive calendar days. Attraction pass for Sydney & Beyond. Over $900 worth of admission fees. Unlimited access to over 35 top attractions in Sydney for 3 consecutive calendar days with transport. Includes free 128 page colour guide book with maps and local knowledge. Valid for 12 months from purchase.